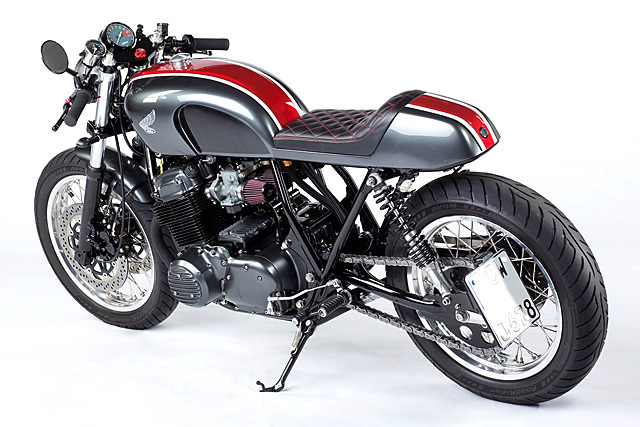 Mighty Motorcycles is the realisation of Josip Bucic’s dream. Nestled deep in the Black Forest of Germany, Josip crafts beautiful pieces of two-wheeled art for a handful of very lucky customers. He has been building bikes for 12 years now and oh boy, does the guy have skills. 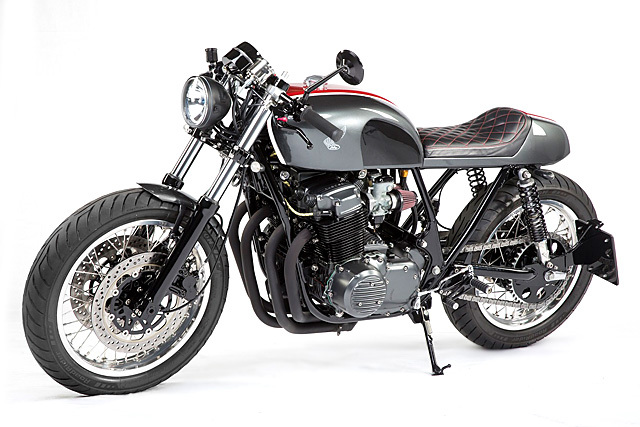 This CB750 was originally intended as a restoration project, but Josip’s exquisite vision saw the potential to create his dream bike, and so he set out to make this one of the best café racers you are ever likely to see – dream or otherwise. Café racers should be slim, sleek and stripped down and to this point, Josip’s bike makes little or no compromises. 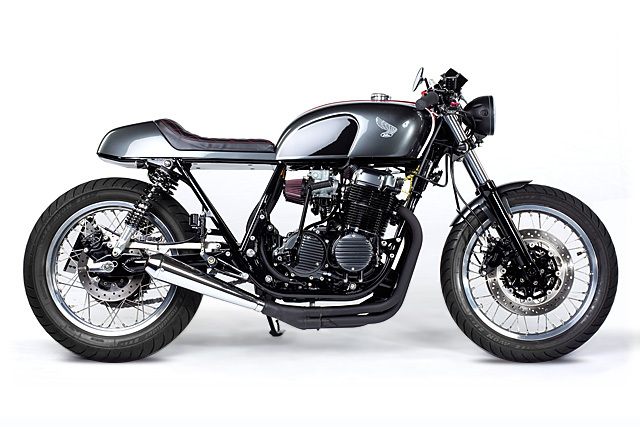 It draws inspiration from the classic café racers of the ‘60s, and has been built with the same objectives – to go fast and hard. 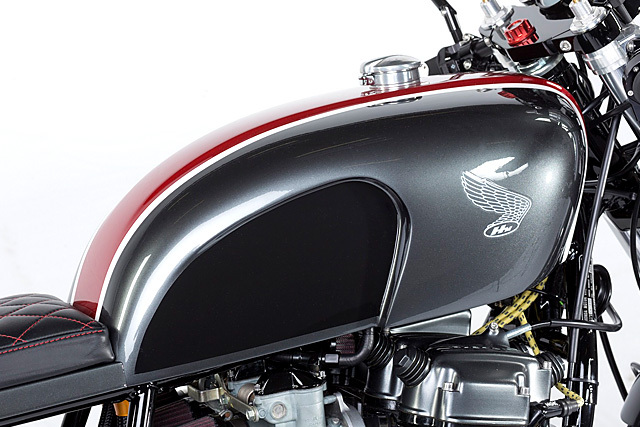 “The vision was to provide old school feel with raw beauty by making a bike like no other. 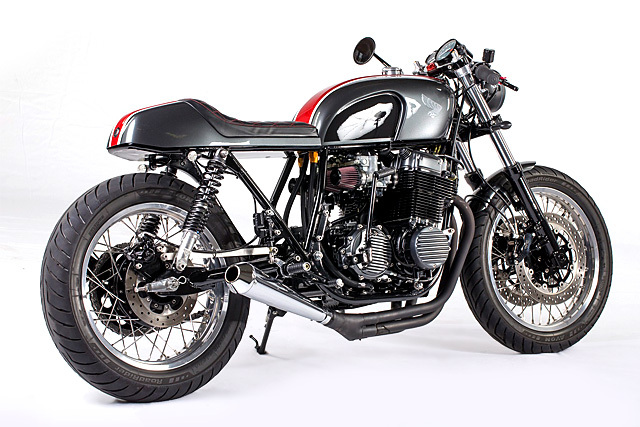 To build a purist motorcycle that only keeps what it needs to be ridden,” says Josip. Make no mistake, this is not some ‘all show and no go’ bike build. 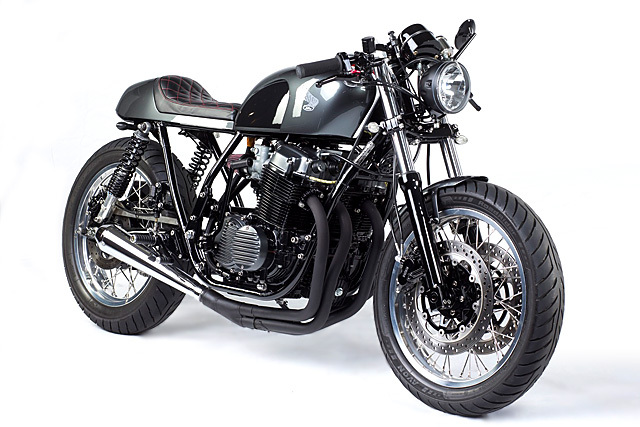 This CB750 is built to play hard. Front forks are Kawasaki ZXR750H2 items; a bike always praised for its awesome front end. These have been stripped and rebuilt with Wilbers progressive springs and mounted in custom-made triple clamps. A custom front hub had to be manufactured to fit the 18″ front XS-Performance wire wheel with a 110/80-18 Avon tyre, leaving space for the Tokico 4-piston calipers. This was all topped off with a pair of Gilles Tooling clip-ons, fitted with V-Trec levers. The rear end is graced with a longer Bol d’Or 900 swing arm which adds stability, while Koni shocks keep it pinned to terra firma. It’s rolling on an 18″ XS-Performance wire wheel, wrapped In a 140/70-18 Avon tyre. As you would expect, the swing arm obviously wasn’t a straight fit and needed modifying to fit the frame. While that would be an engineering feat far beyond most of us, it seems like was no problem for Josip. The rear brake is a Brembo unit, which again wasn’t a simple bolt on job and necessitated the manufacture of an adapter to make it fit. My dad always told me “before you make it go fast, you make it handle,” says Josip. Clearly, he has more than taken care of the handling, what about the faster bit? Well, the ‘fast’ comes in the form of a fully rebuilt, big bore 820cc power plant. The original 736cc engine has been heavily reworked with all new bearings, valves, chains, a bigger bore, new pistons and a ported and polished head. 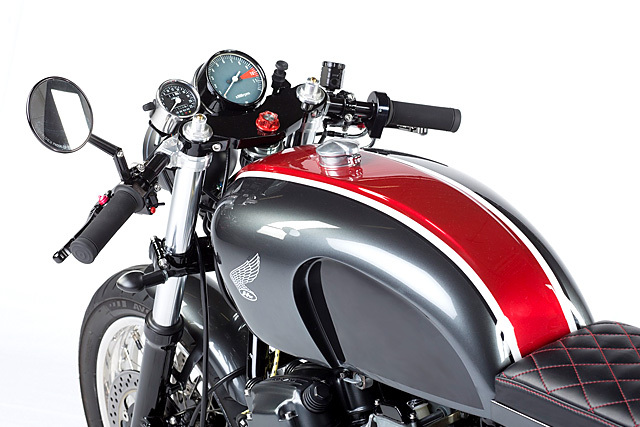 There’s a brace of K&N air filters in place to feed the hungry engine and gasses leave through a hand-made, 4-into-1 exhaust with a classic Motad megaphone. Aesthetically the engine is a work of art. Every single component and every nut and bolt is as good as new, if not better. Josip has invested a huge amount of time and effort into the bodywork. 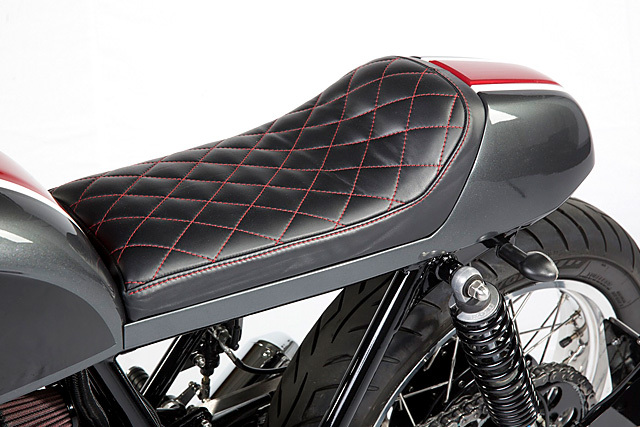 Every piece of it has been painstakingly hand-formed, from the classic bench seat to the mudguard. One of the strongest features of this bike is the tank. It is a true work of art that, while appearing quite simple at first glance, is clearly a masterpiece of understatement and damn hard work. Countless hours went in to sculpting the subtle cut-outs on the side of the tank, which has also been fabricated to incorporate a hidden oil tank. 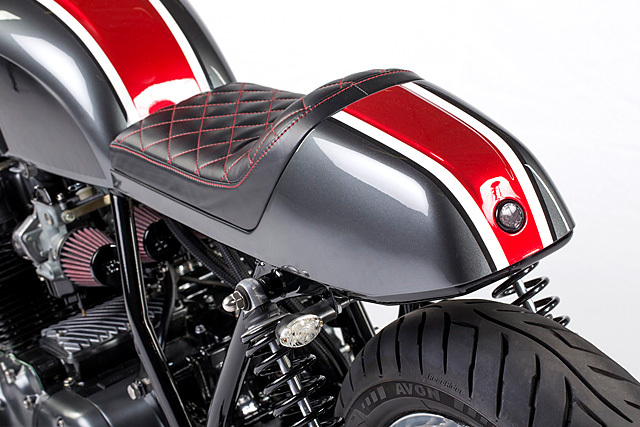 The hand-crafted seat unit has a flat underside allowing Josip to de-clutter the bike, concealing the electrics. 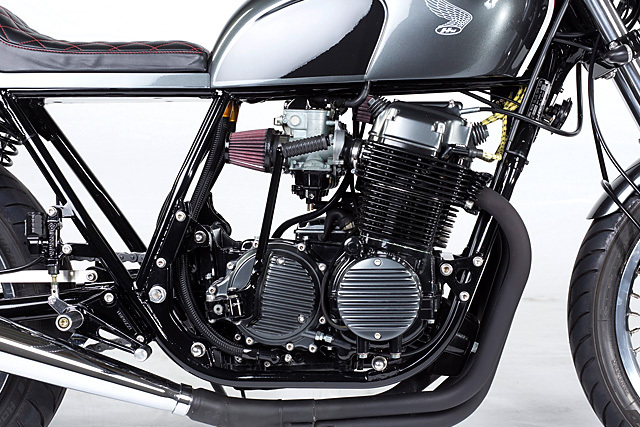 Look in the tank and even in the bike’s frame and you find even more wiring. The minimalist theme is further enhanced by Josip’s use of Rückl LED lights for both tail and indicators. And the best part? Josip says his beautiful bike is for sale. 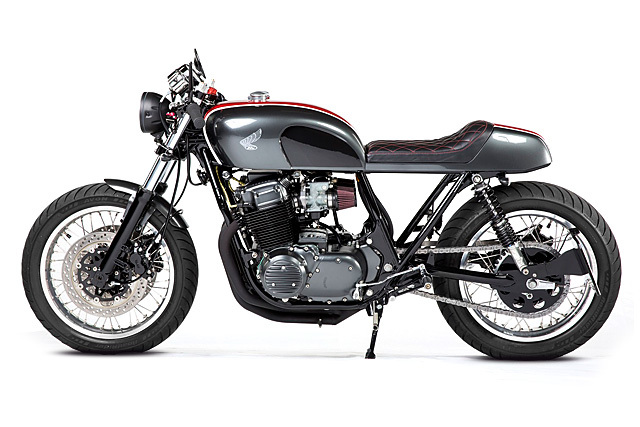 If you can see yourself as the new owner of this dream on two wheels, maybe get in touch before you wake up and find out it’s all a figment of your imagination.